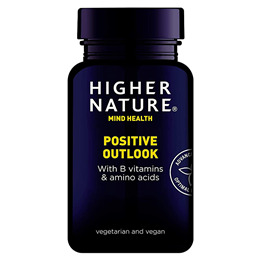 This Positive Outlook formula provides B Vitamins and amino acids, including Glutamine, Tyrosine and 5HTP, to help maintain healthy levels of the mind`s most important neurotransmitters, serotonin, dopamine and noradrenaline - for feeling good and for optimum wellbeing. Vitamins B6, B12, Thiamine & Niacin may support normal function of the nervous system. Vitamins B6, B12, Niacin, Folate & Pantothenic Acid may support normal psychological function & help reduce tiredness and fatigue. Vitamin B6 may help regulate hormonal activity. L-glutamine, L-tyrosine, betaine monohydrate, capsule: hypromellose (carrageenan)*, calcium d-pantothenate, L-5-hydroxytryptophan, lemon blam (melissa officinalis), niacin (as nicotinamide), thiamin HCI, pyroxide HCI, anti-caking agent: magnesium stearate*, anti-caking agent: silicon dioxide; folic acid (as pteroyl glutamic acid), methylcobalamin. Does Not Contain: Artificial colours, flavourings or preservatives, corn, dairy products, gluten, lactose, maize, salt, soya, starch, sugar, wheat, yeast. Adults: Take 2 vegicaps once or twice a day on an empty stomach, or as your health professional advises. Children over 6 years: Take 1 vegicap once or twice a day on an empty stomach, or as your health professional advises. Not advisable if pregnant or in cases of melanoma, schizophrenia, high blood pressure, or if taking fenfluramine, or MAO inhibitor drugs and exercise care if taking SSRIs. Rarely, digestive discomfort can occur which usually disappears by reducing the intake. Can cause drowsiness in sensitive individuals; do not drive or operate machinery if affected. Below are reviews of Positive Outlook - Mood Balancer - 90 Vegicaps by bodykind customers. If you have tried this product we'd love to hear what you think so please leave a review. Couldn't live without this, I've now got all my friends on it too. 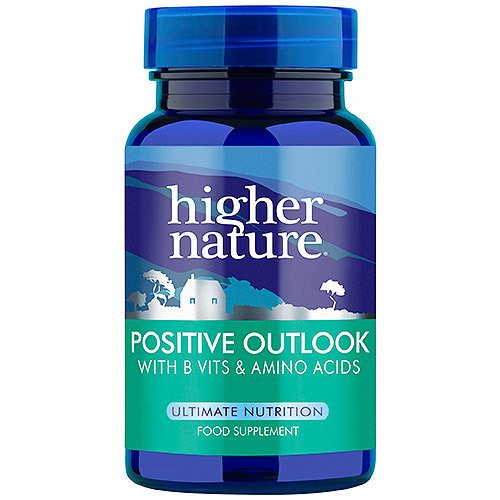 This Positive Outlook formula provides B Vitamins and amino acids, including Glutamine, Tyrosine and 5HTP, to help maintain healthy levels of the minds most important neurotransmitters for feeling good and for optimum wellbeing.